I understand the pressures and stresses of career changes and layoffs. When you are ready to make a change, you may want a professional executive coach. For more than two decades I have had the opportunity to experience incredible growth in technology careers in the Pacific Northwest. Many of my friends and associates have worked in top tier companies that are now household names. Having worked at a few notable places myself I’ve learned a lot about the modern workplace. If you are seeking a coach that knows the contours of the professional landscape, I am happy to schedule a free, no obligation 20 minute coaching session. My first job after college was at a pre-Internet start-up that would have been a great Internet company. It went to market too early and ran out of funding too soon. The good news is the World Wide Web began emerging as a new media. I was hired as the first Website Developer at Wizards of the Coast. There I spent a decade advancing in the ranks to Executive Producer while developing skills in both marketing and technology. That company was purchased by gaming giant Hasbro, and underwent a corporate cultural shift and subsequent layoffs. From there I did consulting at a firm in Bellevue, WA working with large accounts including ChemPoint and Microsoft. That company was also acquired. I began freelance consulting, but after a short while I returned to corporate high technology and gaming at Hidden City Games. That company folded when it did not receive a third round of venture funding (and the market crash in 2008 didn’t help, either). Now, in addition to coaching and career counseling, I work in technology marketing, search engine optimization, online advertising, and social media marketing to keep my skills current in the dynamic landscape of Internet marketing. This ensures I am up-to-date with trends and can easily relate to modern tech workers. My clients are based in the innovative hotbeds of Seattle, San Francisco, and Silicon Valley. After years of corporate experience I started my own business as a consultant. I found a niche providing expert services to small tech companies, non-profits, and agencies. I really saw the differences between private and non-profit business models while learning a lot about LED lighting technology and Federal programs that help low-income residents in our community. Collaborating with executives, I have participated in rebrands and acquisitions in technology, non-profits, and gaming. As a consultant I specialize in Organizational Development, Inbound and Internet Marketing, SEO, SEM, and Web Analytics with clients in Redmond, WA, San Francisco, and Mountain View, CA. Now I am working as a professional executive coach helping clients transition between jobs, change careers, or make an important shift in their personal or business life. Coaching can also help make the most of the opportunities you currently enjoy. 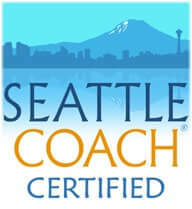 I am a member of the International Coach Federation, and completed my Associate Certified Coach credential in 2016 through SeattleCoach . I completed training in Neuro-Linguistic Programming, Strategic NLP, and Hypnotic Patterns for Learning with NLP co-founder Richard Bandler and NLP for Sales with trainer John La Valle – certified by their training company NLP Seminars Group International. In August 2015 I received my practitioner certificate in NLP training with the National Guild of Hypnotists. For more than 15 years I have been practicing, self-studying, and doing NLP in-the-field. I am happy discussing how NLP can be used as a compliment to coaching – especially if you feel stuck. I hold a Bachelor of Arts in Communication from the Edward R. Murrow School at Washington State University, a graduate of SeattleCoach ICF Coach Training, qualified Myers-Briggs Type Indicator (MBTI) presenter, hold a Basic Mediation Certificate from the King County Dispute Resolution Center, completed Landmark Education’s Curriculum for Living, and am a current member of the International Coach Federation and The Association of Psychological Type. I love media, communications, and the arts and have spent a lot of time involved in music and theater. I have performed in venues all over Seattle and occassionally in San Francisco. I like comedy, improvisational theater, and rock and roll music (and have been a serious performer at different stages of my life). I enjoy cartooning, photography, and a good book, too. “I contacted Tim to help me with communication at work and in my personal relationships. He gave me a lot of great strategies for responding positively in difficult situations and helped me out with conversation tactics which advance and strengthen relationships with friends and strangers.